The House of the Devil. Karen Angel is the niece of Jimmie Angel and President of the Jimmie Angel Historical Project (JAHP). The JAHP’s mission is to provide accurate information about Jimmie Angel. She is working on three books about her uncle: a photo biography for the JAHP; for herself an historical novel and an autobiographical account of her search for the truth about Jimmie Angel. Surely Angel Falls in Venezuela’s vast Canaima National Park was known to the indigenous Pemon people of the southeastern Gran Sabana region for thousands of years. But due to its location on the House of the Devil, perhaps even the Pemons avoided the mysterious Devil’s Canyon within the table mountain’s interior where Angel Falls, the world’s highest waterfall, cascades 3,212 feet. Born in Missouri near St. Louis in 1899, Angel was obsessed with Auyan-tepui; a 435 square mile heart shaped table mountain in the southeastern Gran Sabana region of Venezuela. Auyan means devil and tepui means house in the Pemon language, hence the Devil’s House. Angel believed that it was the home of a lost river of gold that he claimed to have been taken to years before by a mining geologist named McCracken. The name Angel Falls came about during a Caracas reunion in 1937 of Angel and his friends American petroleum geologist I. F. “Shorty” Martin and Venezuelan civil engineer and expert outdoorsman and mountaineer Gustavo (Cabuya: “String”) Heny. They were talking about the waterfall and when they didn’t have a name for it, Heny suggested the name Angel Falls; using Jimmie’s last name because it was he who had made it known to the world. Jimmie Angel and Angel Falls became better known to the world as the result of his October 9, 1937 landing of El Rio Caroni, his Flamingo airplane, on Auyan-tepui in search of McCracken’s lost river of gold. 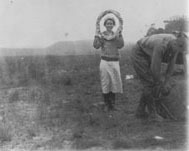 Jimmie’s expeditions companions were his wife Marie, Gustavo Heny, Heny’s gardener and jungle companion Miguel Angel Delgado, and Spanish botanist Captain Felix Cardona Puig. Angel had scouted a landing spot on Auyan-tepui from the air. Heny and Cardona, who was born in Barcelona, Spain, had explored for a foot route from their camp at Guayaraca on Auyan-tepui’s south flank, to the proposed landing site which was on the northern side of the plateau. Their search was only partially successful. A disgruntled Cardona returned to camp after a few days while Heny continued to pursue a northern route. He was able to establish a route across much of the plateau, but was turned back from reaching the planned landing site because of the tepui’s great interior wall. During his fifteen days of reconnaissance, Angel dropped supplies attached to parachutes that had been fashioned by Heny’s sister Carmen. On the morning of the flight, Cardona stayed in camp to maintain radio contact with the landing party that included Jimmie and Marie, Heny, and Delgado who was known for his ability with rope and machete. Marie Angel wrote in her unpublished manuscript that they were well prepared for possible problems; supplies included tents, blankets, flashlights, cameras, rope, machetes, and enough food to last a month. At first, Angel’s Auyan-tepui landing appeared to be perfect, but the wheels broke through the sod and sank into the mud bringing the airplane to an abrupt halt with a broken fuel line and the airplane’s nose buried in the mud. Angel had expected pilots to come to their assistance, but the search was delayed due to loss of radio contact with Cardona. After a few days, the Angel party was presumed hopelessly lost … or dead. On October 11th, when it became clear that there was no gold to be found and that El Rio Caroni was hopelessly mired in her muddy landing spot the landing party started the long march from the mountain to the village of Kamarata in the valley below. 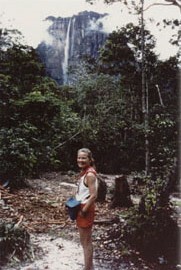 Twelve years later, American photo journalist Ruth Robertson led the first successful expedition to the base of Angel Falls which measured and made it officially the world’s highest waterfall. Her article, “Jungle Journey to the World’s Highest Waterfall,” published in the November 1949 edition of National Geographic is a splendid account of an extraordinary journey. Jimmie Angel’s airplane El Rio Caroni remained on Auyan-tepui for 33 years. Its future was changed in 1964 when the government of Venezuela declared it a national monument. In 1970, it was removed in sections by Venezuelan Air Force helicopters and taken to the Aviation Museum in Maracay for restoration. It was later moved to the airport at Ciudad Bolivar where it remains displayed on the green in front of the passenger terminal. The federal government represented by the Venezuelan Air Force would like to return El Rio Caroni to the Museum of Aviation in Maracay so that it can be properly conserved under controlled museum conditions. In exchange, the Air Force would give Ciudad Bolivar a life-sized model that is under construction at the museum. Although the airplane has suffered serious damage several times from automobiles and a falling tree, the State of Bolivar refuses to return the airplane to Maracay. All photos displayed with the permission of Karen Angel, © JAHP Archive Copyright © 2002. All rights reserved. Except by Karen Angel, no part of this article may be reproduced or transmitted in any form by any means electronic, mechanical, photocopying, recording or otherwise, or stored in a retrieval system, without the prior consent in writing. Karen Angel, Post Office Box 4914, Arcata, California 95518, United States of America. Press trips are always welcomed. However, presently there is little or no assistance from local government and local services. Angel-Eco Tours will review each request on its merit and may be able to offer limited assistance to bona fide travel writers etc. Members of the Press: If you require additional information or would like to arrange an interview, please Contact Us.